Patrick Godet has started to deliver the first privateer 500 Grey Flashes to customers, the first magnesium cased beauty delivered in the world went to Team Motogallur in Australia in early January 2015 where it will be competing in the Aussie Post Classic championship. 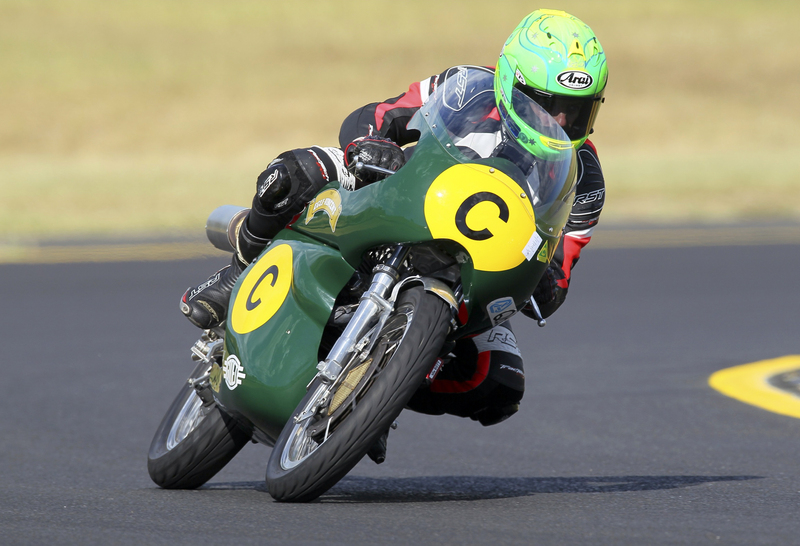 One of the first outings was on 20th to 23rd of March, for the 2015 Barry Sheen Memorial meeting organized at Eastern Creek in Sydney. 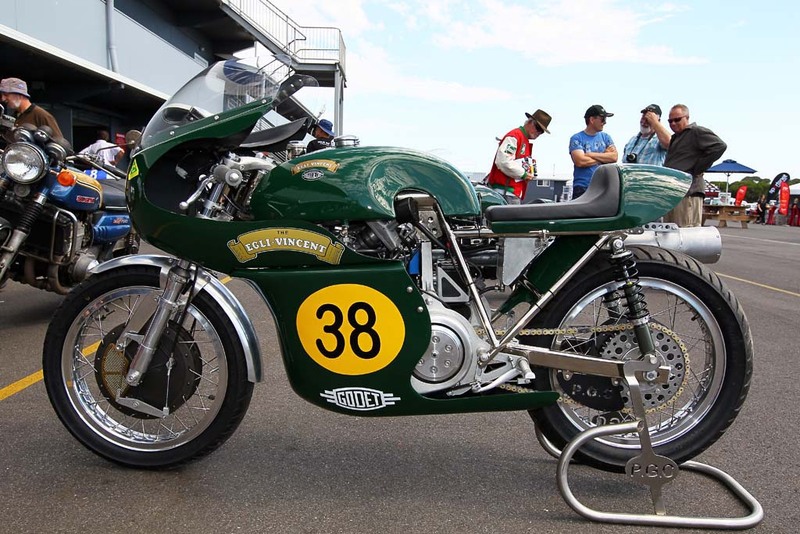 “As the bike has a 1967 Egli designed frame, we entered it in the Period 4 (P4) or Post Classic Class for 500cc bikes between 1962 and 1972,” said Luis Gallur. “We entered three of the four races in P4 and won each of them convincingly with Cam Donald as rider. As Cam missed the first race he started at the rear of the grid on his first race passing 30 riders in 6 laps to win as we looked on from the pit wall stunned by his pace”. “We also were invited to enter the Guest of Honour’s event the Freddie Spencer Challenge where we gridded up against the Macintosh and Molnar Manx’s, Norton ES2 500’s, about 15 of them! 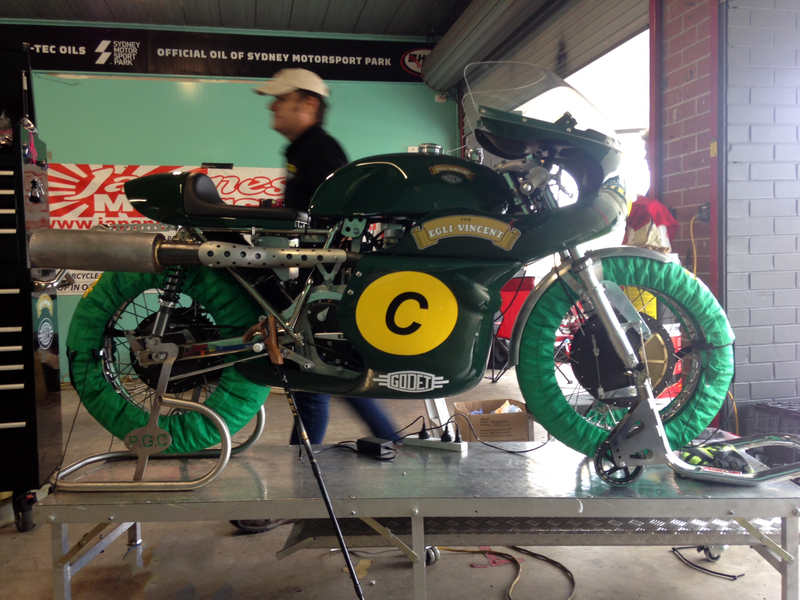 We beat all but one; the fastest British single in Australasia a Norton ES2 from NZ. The racing was close, the ES2 had to brake the lap record to beat the Vinnie by half a second”. Luis is however very confident for the upcoming season as they have had the bike for only two meetings, but they already know it will run faster after the scheduled tuning and upgrades that Patrick Godet and the team are working on. The development is a work in progress and will be available to the other owners of Grey Flash’s he delivers to racing teams. Next year, at the Island Classic, Team Motogallur will run two bikes, an original Vincent Grey Flash in the Classic Class and this Egli-Vincent Grey Flash in Post Classic. A point of detail specific to the Australian regulation is the cut-off date, which is 1962 for the Classic class opposed to Europe where it is 1967. Hence the Aussie team has to compete with more modern 2-stroke and multi-cylinder power plants and disc braked equipped machines, but “we are taking on the challenge” said Luis. Dr Luis Gallur is running his team simply as a passion along with his job of Anesthetist in private practice. 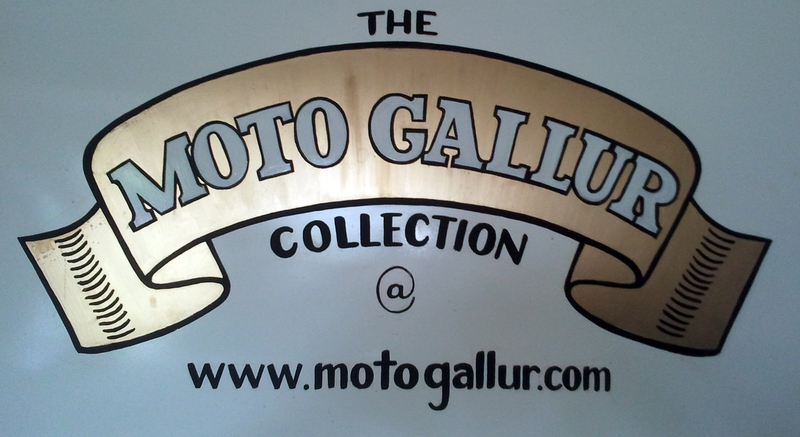 He collects motorcycles and finances the race effort from his funds under the umbrella of Motogallur. “My Vincents and Egli-Vincents Godets are the pride of my collection. 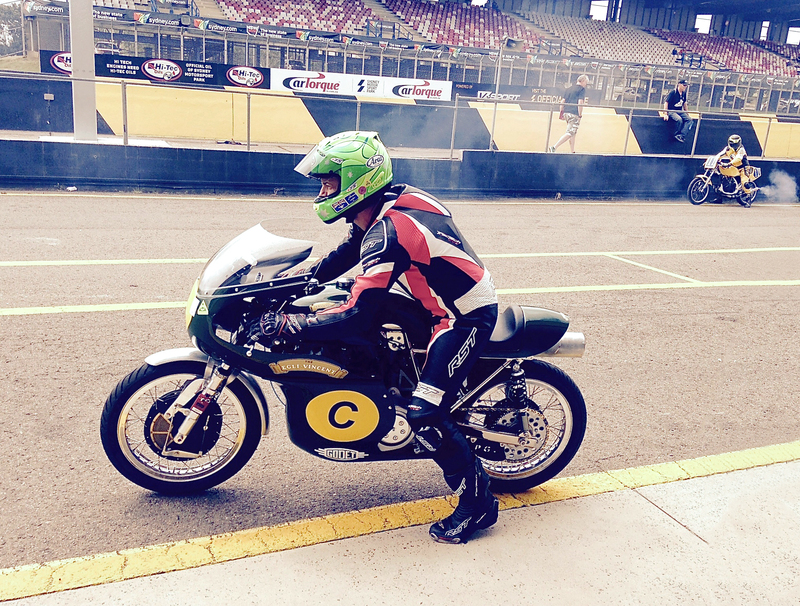 Racing the Flash has brought the bikes alive for me and rekindled the racing bug in the team’s ‘historic’ members! Vive les dinosaurs!” said Luis. The racing team is fortunate to have a rider of the caliber of Cam Donald as it’s historic rider. 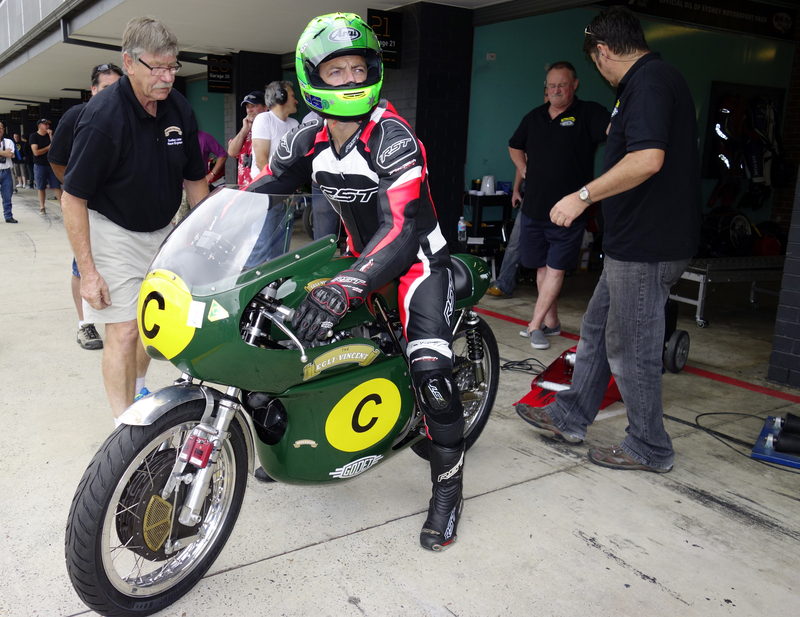 Cam will race the bike whenever it appears; he remains of course the Norton Factory rider for the TT events and rides Period 5 bikes in historic races as well. The calendar must be finalized; Cam has been invited to ride the Flash as part of the Aussie Team in the NZ leg of the trans-Tasman Challenge. Team Motogallur are looking to have fully tuned bikes for the Phillip Island Classic next January and the Manx GP in 2016 and they hope to accompany Patrick Godet’s team to that event. Motogallur’s Crew Chief is Dudley Lister, a previous 20-year Yamaha Factory race mechanic in Europe and Japan. Dudley has prepared bikes for Mick Doohan, Kevin Magee, Dowson, etc. The renowned Australian engine developer Peter Molloy is collaborating with Patrick Godet to unlock the Grey Flash ultimate potential. Peter Molloy worked with Phil Irving and prepared many of Australia’s best motorcycle race engines including Wayne Gardner’s early Hondas.